Electric Hair-Dryer.—This is an idea that will find favor with all women who have long hair and dread the long, tedious process of drying, and the misery and tangles that are a part of the first combing after the hair is dry. It is an electric hair-dryer, partly comb and partly brush. It is connected with an electric wire which heats a sliding plate in the inside. The dryer is passed over the hair, smoothing it and removing the tangles, and drying it at the same time by means of the heated plate inside. It can be easily adapted to every house where electricity is used, as a small wire attached to the lights will do the work required. The hair-dryer is carefully insulated, and there is no danger of the user receiving an electric shock. The dryer should become a favorite toilet article. The softness and silkiness of the hair is greatly enhanced by constant washing, and yet there are many women to whom the dangling of damp locks means a sure cold in the head and sore throat. 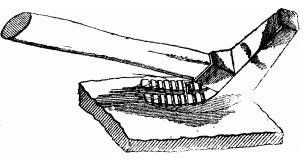 Hammer.—Any one who has tried to pull nails with the claw of a hammer will appreciate this little device which has just been patented. The claw end of the hammer is provided with a number of grooves, into which a little bar fits and locks. 'When you go to draw a nail, instead of the half-dozen hit-or-miss slips that are the usual fate of such attempts, the bar falls down in front of the nail as the claw grips it from the back. The nail is held in a vise and must come out willy-nilly. This new hammer is likely to save amateur carpenters more worry and wounded fingers than any contemporary invention.